I've been adopted an dnow have a bunny girlfriend,too! Hello. My name is Wilbur. 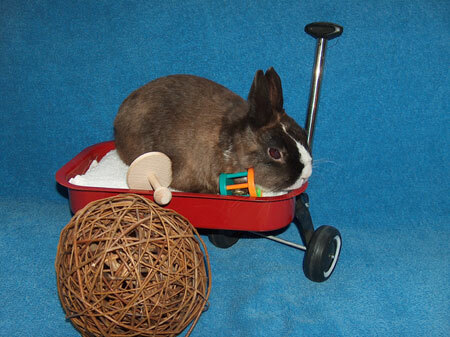 I am an incredibly cute and loving little neutered dwarf boy. I love to say "hello" when people visit me and I REALLY enjoy being petted. People who meet me say that I have very "soulful" eyes. In my deep brown eyes you can tell that I have seen and experienced a lot in my short life (I am probably about 4 years old.) I used to live on the floor of an aviary and my front feet are bow-legged from eating bird seed, which is not healthy for a rabbit. My teeth also are not perfect and I had to have some dental surgery to help with an infection in my molars, but now I am doing well. Whoever adopts me will need to monitor my teeth over time to make sure they stay healthy. Other than that, you really couldn't ask for a more adorable, sweet and special little bunny man to adopt. Please visit me soon!